And yes, he's got plenty of weak points. We now live in a world where "White Haired 20-Something Punk Guy Battles Colossal Monsters and Cracks Wise Far, Far Too Much" is officially a genre. 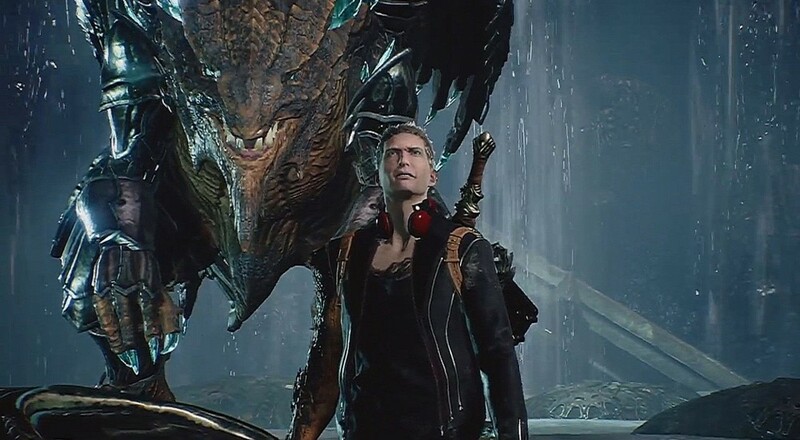 With Scalebound's new trailer at Microsoft's conference this year, the WH2SPGBCMCWFFTM ropes four player co-op into the fold at long last. It also made me realize there is a very thin line between having a chatty main character and having a main character who just seems annoyed to be there. The game looks like it plays great, with that PlatinumGames attention sheer scale of boss fights. Throw in a handful of your homies to bombard the bad guys and you've got a recipe for fun, even if your main character sounds like an insufferable jackass. Look, bro, you don't have to fight the huge bad guys if you're gonna complain the whole time. Maybe get yourself a real job and stop bitching. The game looks like fun though, blending the polish you expect from Platinum with taking down a massive enemy a-la Monster Hunter style. Hopefully we will see more info coming out of the show floor in how you can interact with your buddies. I'm also hoping for an option to silence Main Guy. Page created in 1.1966 seconds.